Eileena has been living in a tent along the Grand Canal for the past month. EILEENA KAVANAGH HAS been living in a tent on the Grand Canal in Dublin for the past month. The 21-year-old has been homeless “on and off” since she left State care at the age of 18. Eileena has spent her time moving through different homeless hostels in the city centre and staying with friends and family. Since March she has been living between two tents on the canal with her partner Gerry (27). Speaking to TheJournal.ie at her tent yesterday, Eileena said that she had been let down by the State since she had left care. “Everybody keeps saying to us, ‘we’re trying our best’,” she said. But they mustn’t be, because if they were trying their best, the amount of us that are actually on the street today wouldn’t be on the street. She said she is not receiving enough State or family supports. The Housing First team (made up of officials from Focus Ireland and the Peter McVerry Trust) has been maintaining contact with the couple. The Housing First team is run in partnership with the Dublin Regional Homeless Executive (DRHE) – which manages homelessness services for the entirety of the Dublin region. The team works with rough sleepers in the Dublin region, securing them long-term or short-term accommodation and ensuring homeless people have a point of contact with State services. “The only ones that are really looking after me now are the Housing First team. They link in [with us],” Eileena said. The aftercare worker finished up with me last month. An aftercare worker is appointed by the State to work with young adults who have recently exited care. Eileena said she was looking for a place for her and Gerry to stay long-term, but it had been difficult for them to source accommodation. Gerry has addiction issues, which makes it hard to find a long-term place to live. Gerry has been living on the canal since January, when he moved to Dublin from Kildare. In that time, he said he had been unable to secure a bed in a hostel. Eileena’s story was first highlighted in a RTÉ News report on Monday. Following this, the couple stayed at an emergency hostel in the city centre on Tuesday night. “Me and Gerry – for the first time in ages last night – we actually got a shower, something to eat, a warm bed,” she said. Somewhere we can put our heads down and not worry about a thing. Eileena said yesterday that the couple were due to go for an assessment for a six month bed at a hostel in the city centre. She said she wants to live in place of her own, and has plans to return to college to study acting when she does. The DRHE said it did not comment on individual cases when contacted by TheJournal.ie. But it has been confirmed that the Housing First team are currently providing assistance and support to the couple. The DRHE pointed towards guidelines on its website for helping people who sleep rough. Eileena said she was first admitted into State care at the age of eight, and spent much of her childhood living in different residential care homes. She said she has a mild intellectual disability, and when she turned 18 she was admitted to a high support care unit to live. However, she said that she was not suited to this type of accommodation as there were more severe cases at the centre. She said she found it impossible to live there as a result. She found it difficult to stay with family also, and so has been homeless in Dublin moving about different hostels in the city centre and sleeping on the streets for about three years. Eileena said she had been told that she would not be able to live in a home on her own due to her having higher needs. However, she said she is determined to have her own place to live. Homelessness charity Focus Ireland recently highlighted the issue of growing homelessness among young adults. The number of homeless 18-24 year-olds has shot up by 78% in the last three years. “When a young person falls into the nightmare that is homelessness, there’s always an underlying reason,” director of advocacy Mike Allen said. Not getting accommodation or support upon leaving State care, family problems, mental health challenges and/or purely economic pressures and unemployment. Eileena said she was hoping to source some form of long-term accommodation soon so that she could begin to get her life back on track. “My life is being ruined by the fact that I’m always outdoors,” she said. “Like, it’s hard for us to have a shower, it’s hard for us to eat healthier foods, it’s hard for me to look out for myself when I’m living like this. I’m not a dog… You wouldn’t treat a dog like this. 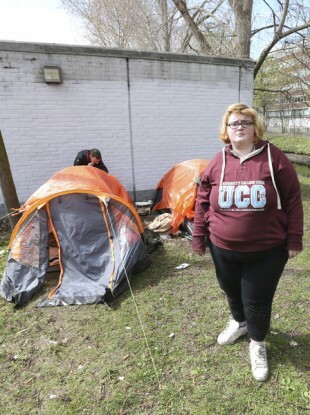 Email “'My life is being ruined': Young homeless woman living in a tent on the Grand Canal”. Feedback on “'My life is being ruined': Young homeless woman living in a tent on the Grand Canal”.